The first European in the area was David Thompson. He, along with several others, established the first trading post called Kootenae House. 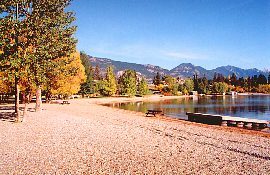 Invermere is a lively tourist area, very popular with Albertans. Windermere Lake is the center of summer activities and Panorama Ski Resort is the focus for winter. 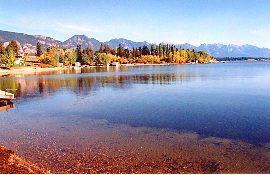 Accommodations: Travellers can choose from hotel, motel, lodge or bed & breakfast accommodations in the community of Invermere. There is also a provincial campground north of the community. Access: Invermere is serviced by commercial bus lines or follow Highway 95 south from Golden to the north end of Windermere Lake. Highway 95/93 south takes the traveller to Cranbrook.